TORONTO - There was to be no Yankees game on the television in the Ortiz household last night. Tiffany Ortiz was planning to get control of the remote and click on the Packers football game. So the Red Sox designated hitter was not going to be waiting up to see whether his team clinched a playoff spot last night - which it didn't when New York beat Baltimore in the final game at Yankee Stadium. "The best way to celebrate is [messing] up your clubhouse," Ortiz said. Indeed, there had been few festivities planned last night, which was just as well. Catcher Jason Varitek said he'd be aware of the situation. Manager Terry Francona said there was a "pretty good chance I'll be asleep." Jacoby Ellsbury planned on sticking around the Sox clubhouse after the bus arrived from the airport, catching the end of the Yankees game with a few teammates. The important thing, they knew, was the Sox won yesterday against the Blue Jays, 3-0, cutting their magic number to 1, and sending them back to Boston almost assured of the postseason. Between their win, an excellent and efficient outing by starter Daisuke Matsuzaka, and the loss by the Rays, the Sox could rest easy on their flight home. "We needed to win today," Varitek said. "It set up, once again, with our starting pitching. It was just important for us to win, win the series, against a team that's a very good team. It was big for us." No more so than for Matsuzaka. In front of 38,814 at Rogers Centre, he threw just 109 pitches over seven innings. That's a number that usually gets him through the fifth. Yesterday, he allowed just two hits, two walks, and struck out six. He had all of his pitches working, and got in trouble only once. That came in the second inning, after the Sox had scored in the first on an Ellsbury triple and Dustin Pedroia sacrifice fly. Vernon Wells smoked a double to right-center on a ball left up and over the plate, the only hit the Blue Jays would get for the first five innings, and reached third on a ground out. Lyle Overbay walked, producing a first-and-third situation with one out. But Matsuzaka struck out Scott Rolen and Travis Snider swinging, both on 92-mile-per-hour fastballs. He allowed just two more runners, stranding Joe Inglett on second after he led off the sixth with a double. "I thought all his pitches had movement through the zone," Francona said. "He threw a fastball in a big situation by Rolen with two strikes, got it up past him. His slider, cutter, changeup . . . I think their hitters had to respect all his pitches, because he was throwing them all around the plate. That gives him a lot of different looks." Said Varitek, "He was able to move the ball in and out, use the breaking ball to both sides, set it up with his heater. He did an awesome job today. It's more so just his location of his pitches, than all of them working. I think that's key more than anything." Matsuzaka recorded his 18th win of the season, a career high. 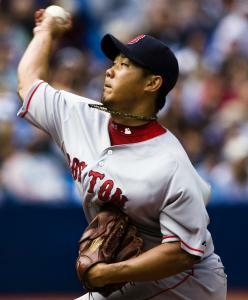 His previous high came in a 17-5 season for Seibu in 2006, the year before he left for the major leagues. He is tied for third in the American League in wins, and he lowered his ERA to 2.80, fifth in all of baseball among starters. "Since the moment I turned pro, I wanted to match my win total to the number on my jersey," Matsuzaka said through translator Masa Hoshino. "It took me 10 years, but I finally got there. But now that I've done it, it just feels like any other win." In the third, on a changeup off the outside part of the plate, Ortiz flicked a two-run homer into the Blue Jays bullpen. It didn't seem like it had quite enough to make it out, but as Francona observed, the ball was carrying with the roof open, especially to left. That homer scored Ellsbury, who had doubled off Wells's glove, his second of three extra-base hits. He added another double in the fifth. "I've been feeling a lot more comfortable at the plate, making necessary adjustments," Ellsbury said. "But at the same time, not overanalyzing. When you start thinking, it takes away from your natural talent." With the Minnesota win, the Sox moved to two back in the loss column in the AL East - and, as soon as their game was over, on the brink of the playoffs. "We don't take anything for granted," Francona said. "We played a pretty good game today. We'll show up tomorrow. We play good, and do all our stuff, those magic numbers will take care of themselves."